La croissance rapide de l’économie brésilienne stimule l’expansion du secteur automobile en termes de production et de vente. Cependant, chaque marché possède ses propres caractéristiques et les constructeurs ont toujours eu à développer des stratégies différentes pour réussir dans chacun de ces marchés. Aussi, certains gouvernements dans les pays en voie de développement essaient-ils souvent de protéger les constructeurs nationaux, ou d’obliger les grandes firmes internationales à financer le développement de l’industrie automobile locale (l'article complet en anglais). Brazil’s fast growing economy boosts continuous growth in the automotive sector, both in terms of production and in sales. However, each market is different, and carmakers have had to employ different strategies to succeed in them. Some governments in developing countries try to protect indigenous manufacturers or they force global car firms to invest in the development of national motor industries. In China, for example, the government has until recently insisted that foreign manufacturers can set up shop in the country only through joint ventures with Chinese partners. In other countries car firms have learnt that they have to be on the spot in order to understand local conditions. This is very important if a car firm wants to succeed in a country like Brazil. The Brazilian market is still dominated by the four firms that have been there longest—GM, Ford, VW and Fiat—and they have always managed without local partners. Last year their combined share of a market of 2.45m light passenger vehicles was 80%. Fiat, which began manufacturing in Brazil 32 years ago and now market leader, allows its Brazilian arm a lot of autonomy. All its senior managers are Brazilian. They say they want Fiat to be seen as a Brazilian brand— by for example sponsoring Brazil’s best football teams. Veteran VW, 55 years in the country, claims that Brazilians strongly identify with them already since when the Beetle was the country´s most popular car even though the top management is mostly German. More than 3m were produced at the firm’s giant Anchieta factory near São Paulo between 1959 and 1986. 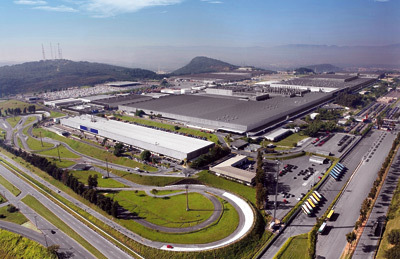 Because of high import taxes, carmakers chose to manufacture in Brazil. Besides of making some of their newest models, both Fiat and VW produce some cars specially designed for the Brazilian market such as the Fiat Palio and VW Gol. Both are rugged and small but roomy cars with a range of “flex-fuel” engines that run on any combination of ordinary petrol and cane-based ethanol. The carmakers’ willingness to invest to meet the Brazilian market’s particular needs shows in the development of flex-fuel engines. The technology was developed by Fiat and VW who began equipping their vehicles with flex-fuel engines in 2003. These days such engines power nearly every car being made in Brazil. About half the fuel used by cars today in Brazil is ethanol. For ordinary Brazilians the attraction is that it sells for little more than half the price of normal petrol, although its range is slightly shorter. The government is also keen on ethanol because the industry employs over a million people, saves on imports and provides insurance against high oil prices. It is also relatively clean, producing lower “well-to-wheel” emissions than petrol, unlike the corn-based ethanol being sold in America; and it is sustainable, taking up only 2% of land currently in agricultural use. Both Fiat and VW emphasize the need to develop their cars locally. Fiat says that cars designed for European conditions won’t last long. Good ground clearance and heavy-duty suspensions are important to challenge the conditions of the roads in Brazil. But even though both makers have recently taken to producing what are known as “SUV-lite” versions of ordinary cars, the market is dominated by fairly spacious cars with small engines. Cars with engines up to one liter attract a lower level of purchase tax, making them the choice of more than half of Brazilians buying a new car. The biggest worry for Brazil’s big four is that the car business is rapidly becoming more competitive. Two French makers, PSA Peugeot Citroën and Renault, took nearly 8% of the market last year, followed by the Japanese, led by Toyota and Honda. The South Koreans are beginning to take an interest too. Jackson Schneider, the president of ANFAVEA, a trade body, predicts that by 2013 Brazil will be the world’s sixth-biggest car producer, turning out more than 5m cars, 4m of them for the domestic market. What wider lessons can the world’s car companies learn from their experiences in countries like Brazil that will provide most of their growth in the years to come? The first lesson is that they must show commitment. Getting there early brings big advantages, but they have to be built on. Fiat has done well in Brazil—even though it arrived after Ford and GM—because it understood the market better, trusted its local management and invested heavily. The second lesson is that no single business model works in every country or for every company. The third lesson is that local conditions and local tastes must be catered for when adapting existing models that have done well in mature markets. The fourth lesson is that although their tastes may differ, Brazilian customers are no longer prepared to put up with outdated or inferior offerings unless they are very cheap indeed. Specialist magazines, the internet and, above all, increasing competition among the manufacturers have greatly raised buyers’ expectations in just a few years. The final lesson is not to get carried away by big numbers. If car makers remain patient and handle the large competition well, they will see that sales will grow on a scale as never seen before. Interestingly, foreign part suppliers are in full swing building production capacity and bringing innovative components to the Brazilian market. For example, around Betim (Belo Horizonte) and Campinas (São Paulo) a series of European and US suppliers are either directly competing or active in joint-ventures with Brazilian counterparts. The sector is currently highly dynamic and offers a lot of opportunities for value added, innovative and flexible companies. If you want to take full advantage of the fast growing component market in Brazil, please get in touch with us.